You may have heard me review on Harley on Episode 232 of the Action Figure Blues podcast. Obviously, this will be similar, but with pictures. 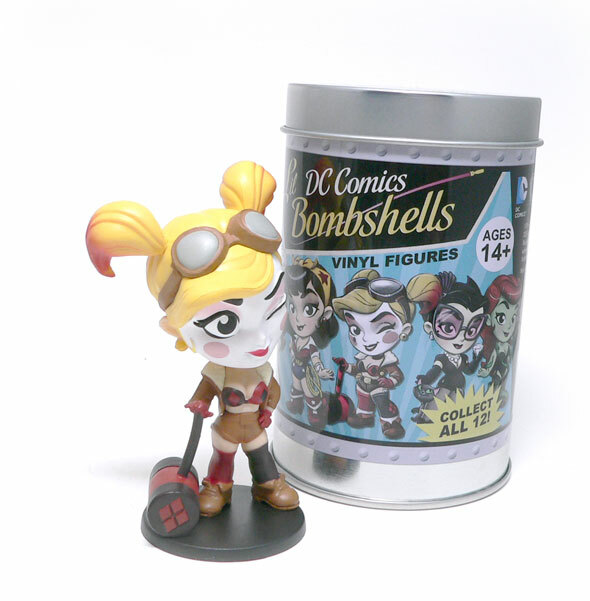 The Lil’ Bombshells are a vinyl mini figure take on very popular Bombshell property. I’ve came very close to getting some of the statues, but I’m not really a statue guy. 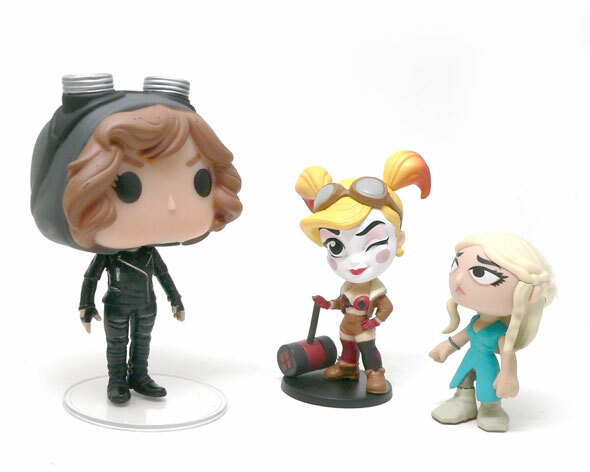 But I do like mini vinyl figures. I mean they’re like mini statues, right? First up these aren’t blind bagged or boxed. They come in a can. It’s resealable so you can use it to store all those extra Figuarts hands you have laying around. The graphic on the can says “Collect all 12!” and has a picture of them on the back. I do wish they had the pack ratio like the Mystery Minis and Titans do. Inside, the figure is in a clear bag and fully assembled. 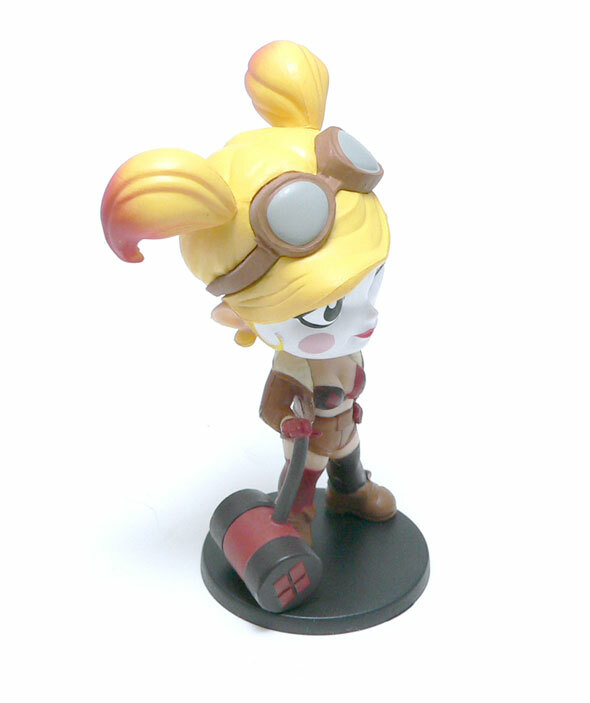 The first one I picked up happened to be Harley. Now, I’m not a huge Harley Quinn fan, but I do like what Ant Lucia did with the Bombshell art. the bomber jacket on a pinup girl just works. The art on the outside matches exactly what she looks like. 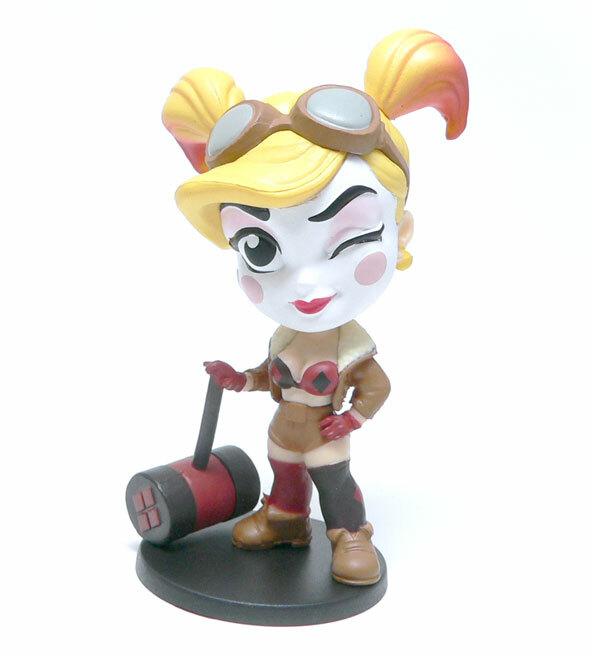 Harley standing in an upright pose with her hammer next to her. She has her tight short, bomber jacket and face paint. The face is painted white and there is flesh tone behind her jaw line. It almost looks like a china doll mask. On top of her head is a set of goggles. 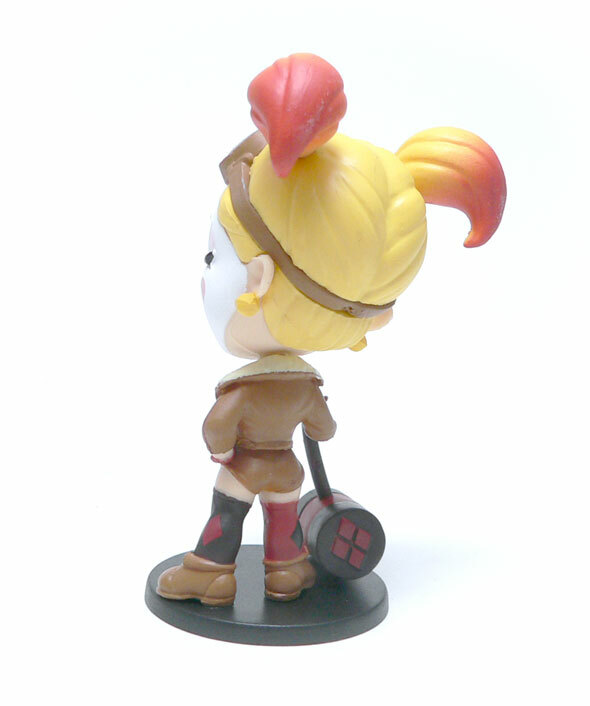 The tips of her pig tails have a nice graduated red effect on them. The paint on the rest of the figure is equally good. The lines are crisp and where the red and white touch, there are no issues. Overall, considering the size of the figure, the paint work is good. That said there is one bit of paint missing I think. The statue has a Joker design on the back of the jacket. I think that really is a really great touch considering the Bombshell theme. The original art also has her with a revolver instead of her hammer. I imagine for the cute factor, they decided to tone it down. Now, about that winking eye. The pictures I’ve seen of the statue, the wink doesn’t bother me. I’ve had Harley on my desk for a while now, and I have to say that the novelty of the wink wears out. I have to say I’m not sure if it is the wink itself or the overall pose. She is posed to be in almost a museum type pose. That combined with the wink just doesn’t sell it. The statue line was a bit more dynamic in it’s pose so Miss Quinn looks like she has been frozen in time. Here, she is static and it looks like she glued her eye shut putting on fake eye lashes. To give you an idea of size, these figures are between a Pop! vinyl and Mystery Mini. The price at Wal Mart was right around ten bucks. Now, the paint is better than a Mystery Mini. But, I just don’t feel the difference in value. There is absolutely no articulation here. The head doesn’t turn and the static pose just don’t quit hit the right chords with me. A couple dollars cheaper, I’d be getting one of these every time I go to the store. If you are are like me and like the Bombshell art but aren’t into statues, this isn’t a bad way to go. However, since a Bombshell action figure line was introduced at SDCC, I would have to think twice about getting more of these. Marvel Vs. DC Hero Bracket - Round 3 Voting Open!